"It's essentially the same way that coral is made in the ocean," Dyllon Randall, their supervisor at the University of Cape Town, told the BBC. Normal bricks need to be baked in high-temperature kilns that produce large amounts of carbon dioxide. The engineering students at the University of Cape Town (UCT) have been harvesting urine from men's toilets. After first making a solid fertiliser, the leftover liquid is then used in a biological process "to grow" what the university calls "bio-bricks". The process is called microbial carbonate precipitation. The bacteria produces an enzyme that breaks down urea in the urine, forming calcium carbonate, which then binds the sand into rock hard, grey bricks. How many loo breaks to make a brick? So to make one urine brick, you'd need to go to the loo about 100 times. The strength and shape of the bio-bricks can be altered as required. "When we first started this process last year, we achieved the same compressibility strength as a 40% limestone brick," Dr Randall told the BBC Newsday programme. "Just a few months later we've doubled that strength now just by changing the material we put into the mould and allowing the bacteria to cement the particles for longer - with zero heat, at room temperature." Regular bricks are kiln-fired at temperatures around 1,400C (2,552F), according to the University of Cape Town. But Dr Randall admits their process is much smellier. "Say you had a pet and it peed in the corner, and you have that strong smell - that's ammonia being released. This process produces ammonia as a by-product," he said, adding that this ammonia is then converted into nitrogen-rich fertiliser. But after about 48 hours, the bricks completely lose the ammonia smell - and they do not have any health risks either, he said. "The process we use in stage one kills all harmful pathogens and bacteria because we operate at an extremely high pH that has been shown to kill pretty much everything." According to UCT, the concept of using urea to grow bricks was tested in the US some years ago using synthetic urea, which requires a lot of energy to produce. 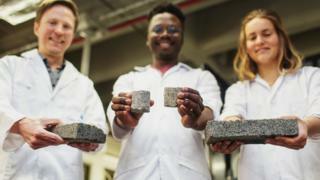 The bricks produced by Dr Randall and his students, Suzanne Lambert and Vukheta Mukhari, use real human urine for the first time, which offers opportunities for recycling waste. They take between four and six days to grow - if you want a stronger brick you leave it for longer.